"I learned to sew as a girl and made most of my own clothes through high school. I didn’t really begin to LOVE sewing until I started quilting about 5 years. Since then I have made wedding gifts and baby quilts for family and been able to give away special quilts to special friends. My favorite part of quilting is putting my quilt together and watching it transform into something that is unique and beautiful. I still have my mom’s PFAFF that is about 35 years old. It has never had to be serviced and sews like a dream. I “graduated” to the Performance 5.0 when I wanted to be able to free motion quilts on my own. I love free motion and continue to learn new things and try different techniques. 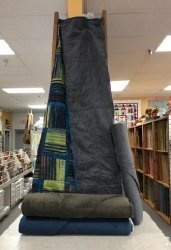 Quilting has become my “happy place!”"
We have received our first shipment of Organic Yarns from Blue Sky Fibers out of Minnesota. 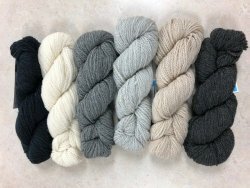 We received a variety of colors in Skinny Organic Yarns, Organic Cottons, and Worsted Wool. 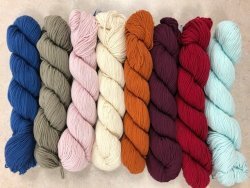 The yarns are so soft and very smooth to knit or crochet with! Next best seller this past week, was our shipment of Fireside! This fabric is so soft and makes a cozy backing for your quilts. I'd love this winter to cuddle up under a quilt using the Fireside fabric. Patty made this quilt that is on display, and we have an order out for the pattern and I am trying to get in more of the batik material. If you are interested in ordering either, please just let us know and we will put you name on a special order form and call you when we get the items. Speaking of batiks, this line of blenders from Batik Textiles came in last week. Not very often do we see solids in batiks, but this fabric line makes a gorgeous addition to our batik area. This is our second shipment of these cute totes from Moda. You can purchase the tote with or with out the insert. 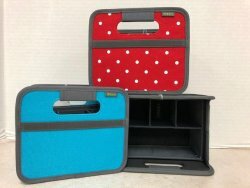 There are several uses for these totes and they would make a nice Christmas present for your favorite quilter! 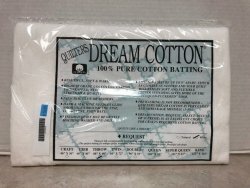 Lastly, we received in a new size of Quilter's Dream Cotton. The Throw size is 60"x60". As a proud sponsor of the Des Moines Area Quilter's Guild Show, we have coupons in the cafeteria area for 20% off any full yard cuts of fabric. Please bring the coupon with you to the store and hand us the coupon at time of fabric cutting. 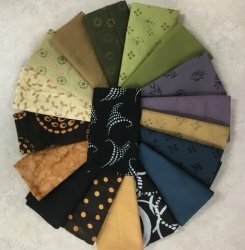 Not able to get to the Quilt Show? Just mention this coupon at the time of cutting this week 09/25/2018-10/01/2018 tp receive 20% off any full yard cuts of fabric.